When Stefanie was kind enough to let me sit in on one of her rehearsals and watch her dancers perform, the thought that immediately went through my mind was how the dance explores the struggle between creating art as a group versus the wants and desires of a creative individual. The dancers projected this. Each one seemed lost within his or her own world, journeying toward a moment of self-discovery, yet coming together throughout the performance for passages of movement that could only be created communally. The charged energy of the figures was obviously symbiotic as they worked together, but that did not cancel out how each dancer existed and explored movements alone. The use of the egg in the dance was aptly chosen for this reason as well. Its form and function certainly resonated with me. The egg shape is one of those universal symbols of birth, life, and potentiality. The fact that there is a duality to all of these - that each of us can experience them as individuals and in more complex human relationships - was one I explored in my paintings. 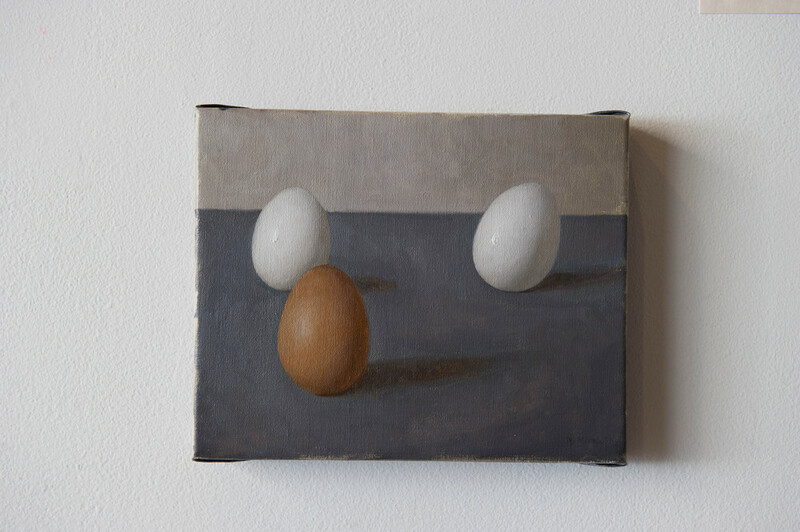 In Ovum Triptych, the egg simultaneously exists as both still-life object functioning alone, and as figure in an assemblage. The egg becomes the self-reflecting dancer lost in his or her own world, and the perfect icon of unity or shared idea. But, most of all what drew me to the egg - and what stayed with me from the dance - is that one does not know what kind of outcome the egg will bring about. On one hand, this is a frightening prospect. The unknown can harbor unexpected events and entanglements. But, on the other hand, all the promise and potentiality of what lies within the egg is alluring, mysterious, and incredibly enchanting. My paintings explore the intersection of mythology, ecology, and humanism. Visually inspired by the Baroque, and on a Hellenistic scale, they take a polytheistic approach to contemporary folklore, questions of progress, and the experience of human narrative in the face of technological change and the struggle to find meaning in a world poised between expansion and decay. When I first saw Stephanie Batten Bland rehearsing A Place of Sun I knew I wanted to work on this project. It is inspiring to see the epic and tragic subject of the oil spill in the Gulf treated with such dignity. It reminded me at once of the beauty of nature and the grace of birds we witness everyday, and often forget even to notice; of how delicate life can be; and how easily it can be lost. My painting, Leda on the Gulf Coast, was inspired by the myth of Leda and the Swan in which Zeus seduces Leda in the form of a beautiful swan - in a sense the ultimate communion with nature and experience of the beauty of a wild animal. This is juxtaposed against the Gulf of Mexico Oil Spill, which is perhaps the ultimate timely representation of the careless abuse and exploitation of nature and the casual slaughter of countless birds, fish, insects, and plants.